World Football Commentaries: Jurgen Klinsmann: "You Can't Stop Soccer Anymore in This Country"
Jurgen Klinsmann: "You Can't Stop Soccer Anymore in This Country"
US men's national team head coach. US Soccer has courted Jurgen Klinsmann since 2006. Today, he was introduced at Niketown in New York City as the new head coach of the US Men's National Team. "You are the only country in the world that has the pyramid upside down. That means you pay for having your kid play soccer. Because your goal is not that your kid becomes a professional soccer player because your goal is that your kid gets a scholarship in high school or college. Which is completely opposite from the rest of the world." Source: ESPN, June 2010 from South Africa. With Sunil Gulati, President of US Soccer. "I'm really excited about the chance to coach the US team having lived here for 13 years." "I've always stayed for family reasons very connected to the US program." "US Soccer doesn't need fixing... You build basically on what was built before. And if you look back on the last twenty years a lot has been built." "I have played in different countries, and they all have their own identities and style... The Italians sit back and wait for you to make a mistake and then kill you for it. Soccer reflects the culture of a country." "I won't select a permanent coaching staff until two months from now. I'll work with guest coaches/technical advisers until then... We want to build a network to move US Soccer forward." "I want Claudio Reyna (US Youth Program leader) very close to me and he will be part of the staff." "I want Tab Ramos' (A former US national team player in the 1990's) perspective at the U-17 and U-20 levels." "Youth teams should reflect the mixture of your cultures. That's why Claudio Reyna will be so important. There is so much influence coming from the Latin environment in the last 15 years. It has to be reflected in the US national team... You won't have a copy at U-17 or U-20 with the senior team... There should be a broader understanding of how youth teams should play. Youth academies will get bigger and bigger. Media have to have your say in it." "We want to play possession. We want to dictate the pace of the game." "Expectations are always based on the last 15 to 20 years. In Germany, the expectation is to be in the final. Here, it's different. A Quarterfinal is huge... You want to improve. Get better. In the knockout stage, anything can happen... The foundation is youth. How much time they should spend with the ball (etc.) all feeds into Claudio Reyna's new role." "The amount of time that kids play the game is missing. A kid in Mexico plays 20 hours a week. Perhaps four is organized and 16 unorganized with his buddies in the street. Passing, instinct on the field it shows. A lot of work is ahead of this. MLS has come a long way but still a hectic college style. We have to get it on a more comfortable, technical level with the ball. We have a long way to go to break into the top 10 in the world. We have to be realistic that we're not in that group yet." Mr. Klinsmann said publicly what many thought privately: A lack of Hispanic influence, rigid nature of college soccer and the lack of unorganized soccer. The soul of soccer comes from the streets/playgrounds/beaches around the world. American parents and children don't understand this basic concept. Arnold Schwarzenegger once said "If you read 15 minutes a day on a topic you'll be an expert in 1 year." We need to apply that method to street soccer in the USA. Children need to be encouraged to embrace the ball as a friend without parental and coaching supervision 24/7. For many American children, soccer is seen as work instead of pleasure. 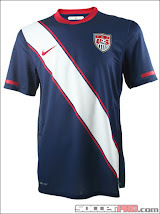 Please click the image for US team gear at SoccerPro.